On a trip a couple years ago, Dave and I sought out an interesting geologic phenomenon: the Victorville Narrows of the Mojave river, after reading the discussion of it in Geology Underfoot in Death Valley and Owens Valley by Robert P. Sharp. The Mojave river is interesting because for most of its length it flows entirely underground. Looking at the wide, sandy, dry washes along the many miles of its length you'd never suspect that a year-round river was flowing beneath the surface. One of the few places it comes to the surface is near Victorville, CA, where a big chunk of rock gets in the way and forces the water to the surface for a short distance before it disappears back into another sandy wash.
That's all background to the interesting discovery we made at Alum Rock park yesterday, where Penitencia creek and its tributary, Aguage creek, have been looking progressively drier over this past month. Walking upstream along the creek trail, we saw a fairly normal looking lower creek up to the bridge at the last parking lot. Just a little further upstream beyond that parking lot, the creek follows a series of little cascades and pools. 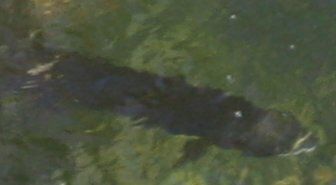 The pools are only a few feet deep at this time of year ... but in one, we saw quite a large fish, about a foot long and looking vaguely catfishy. How does something that big live in a stream this shallow and ephemeral? 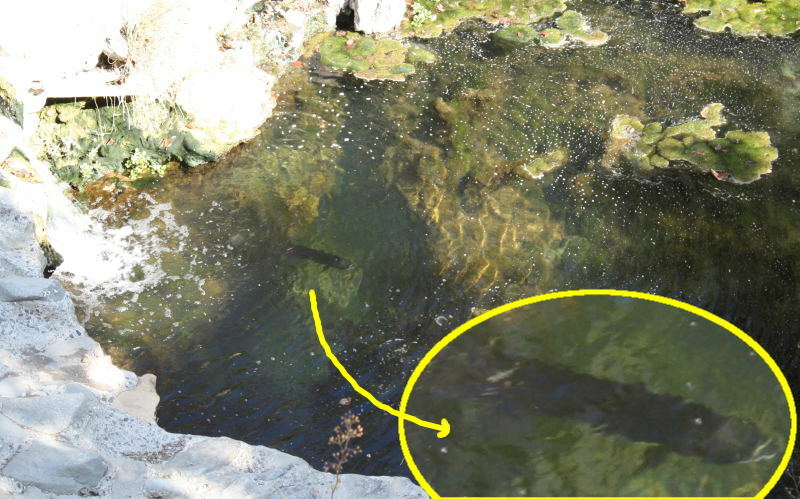 Not only that, but just upstream, as the stream crossed under the park road near Sycamore Grove, it disappeared. We knew there had to be water because something was feeding those pools and the lower creek -- but it was all underground here. We continued upstream, and discovered ... the Alum Rock Narrows! Right by the steel bridge over the creek, the dry Penitencia and Aguage creeks become wet as water is forced to the surface at their confluence, only to disappear again some fifty feet downstream of the bridge. It was very like the Victorville Narrows in miniature ... right here in the big city. Not for the first time, I wish I could find a decent geologic map of this fascinating park!